Here’s an article the Minneapolis Star Tribune published a while back. I’ve edited and expanded it for my book, but this still gives you a pretty good introduction to my passion for living a green and frugal life. Click on this link or read it here. 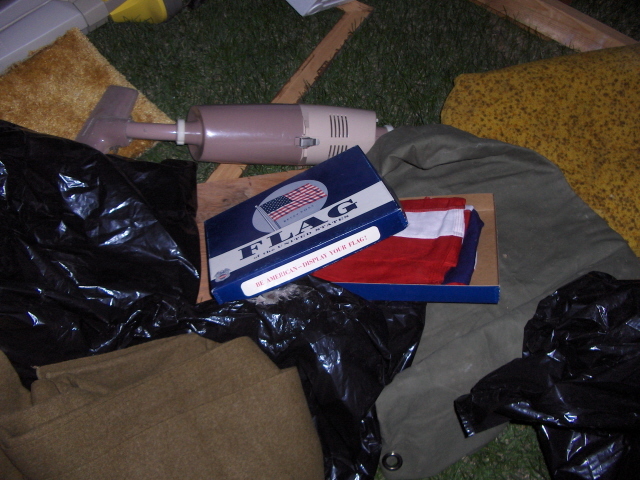 I just found a new American flag, still folded in its box, in a pile of trash on the curb. The instructions for flag etiquette in the box say, “The flag should never touch anything beneath it, such as the ground, the floor, or water.” Does that include trash? I rescued it, of course. We’ve debated for years whether desecrating the flag should be a crime or is protected speech. But I doubt many would argue that it wasn’t disrespectful and wrong to put the flag on the trash pile. While we demand respect for the flag, we should remember to respect the earth, too. The streets are flowing with furniture, appliances, clothing, toys. Flowing with some things, yes, that need to go to the landfills and recycling centers. But flowing, also, with things unique and useful, or perhaps needing repair. And, sadly, flowing with things of so little substance or strength, with such a trivial, fleeting purpose, with so little true beauty or integrity or usefulness that they should never have been produced in the first place. Yet they were, conspicuously consuming the earth’s resources. Then, after so brief a life, heading for decades in the landfill, with no hope of ever decomposing into life-giving compost or even so humble but honorable an end as food for microorganisms. I’m one of those people who cruise the neighborhoods on curbside cleanup days, aka “Curbside Boutique.” I’ve been doing it long enough, along with shopping at rummage sales, that I rarely visit stores, yet have plenty of everything I need. Brand-new clothes, cookware, books and other goods, unused, with the tags still on them. When there are children shivering, people homeless or just struggling to make ends meet in a weak economy, is it OK to put these in the trash? What about the many quality coats I’ve found that could keep people warm, which are bound, instead, for the burgeoning landfills? What of the many gifts, given in love or hope or obligation, that may not have been exactly right (or of which the recipient already had three) that end up hidden in the black plastic bags on the curb? Hidden, that is, unless someone opens the bag to discover it, wondering why it was not given to Goodwill, or Bridging, or the Vets, or the Lupus Foundation, or the local church rummage sale. Wondering why it was not given the chance to be a gift again — to someone for whom it may have been perfect. The good news is that I’m not alone. When I asked a number of people if they minded having their picture taken rescuing goods from a mountain of trash, to use when I give talks about my lifestyle, they all smiled and posed happily. We agreed it was those who threw out perfectly good items, instead of giving them away, who should be embarrassed — not us. Our thrill at finding treasures in the trash is fraught with the sinking feeling that there is something terribly wrong here. That the scales of consumption are perilously tipped. While significant parts of the planet are struggling for even basic needs — food, water, shelter, clothing, education — the biggest concern of many Americans is what to do with all their stuff. When their desperate attempts to organize it fail, they “just get it out of here,” with little regard for where it came from or where it’s going. An old friend once said to me, “If everyone lived like you do, our economy would collapse.” But we’re finally coming to realize that if everyone lives without reducing, reusing, or recycling, our ecology will collapse. Then so will the economy. When even our government believes the answer to an ailing economy is to shop — which usually entails throwing the old whatever away — I believe we’re in trouble. Is it really stimulation we need, or innovation? I doubt that the person who put this flag on the trash pile was intending to make a political statement. But it spoke to me, loud and clear. Daily I hear people thanking our military men and women for sacrificing so that we can live the way we do. Is this lifestyle worth their sacrifice? The laws of nature strive for equilibrium. An out-of-balance world is a dangerous place. I feel Exactly the way you do Holly. It makes a person ill to see the waste at the cost to our environment. As though we’re mindless we march to the stores or computer to purchase to fill a hole inside us. It’s really an addiction and the advertisements in the mail are the “pushers”. Long ago it was discovered that you can create a “need” in people by showing articles. And now it is coming via internet. Maybe things will turn back to the ’70’s subsistence/sustainability goals but only when people are choking in their own waste. I have walked into a “T….. store only to have the very disturbing visual of everything in the store being in a landfill.